I have been putting together a presentation for a client on KM roles, and the KIM career path. It struck me, as I was compiling the slides, that there are two types of KM roles in an organisation; one take by business staff but with a KM focus, and one taken by KM staff, with a business focus. The business roles are focused on the business outcome which KM supports, while the KM roles focus on the effective operation of the KM processes. For example, lets look at roles in the project organisation. There is a role we could call the Business Knowledge manager or Business Knowledge Champion for an area of the business such as a department, a division or a project. and that KM works for the benefit of the business. They don't conduct KM processes themselves, but they ensure KM processes are conducted. In my experience, this is a role owned by a business person, and they may also own risk management, quality management or another parallel discipline. Then there is a role which supports this person, which we could call the business knowledge facilitator. facilitate Peer Assists, Knowledge Cafés and After Action reviews. This role is sometimes known as a learning engineer, or a learning historian, and is a role for a practitioner with KM skills. I would suggest we could call this a KM role. In the Communities of Practice there is a similar distinction between business roles and KM roles. The CoP leader is usually a business role, while the CoP facilitator (who has a much greater emphasis on the mechanics of knowledge transfer within the CoP) could be considered a KM role. 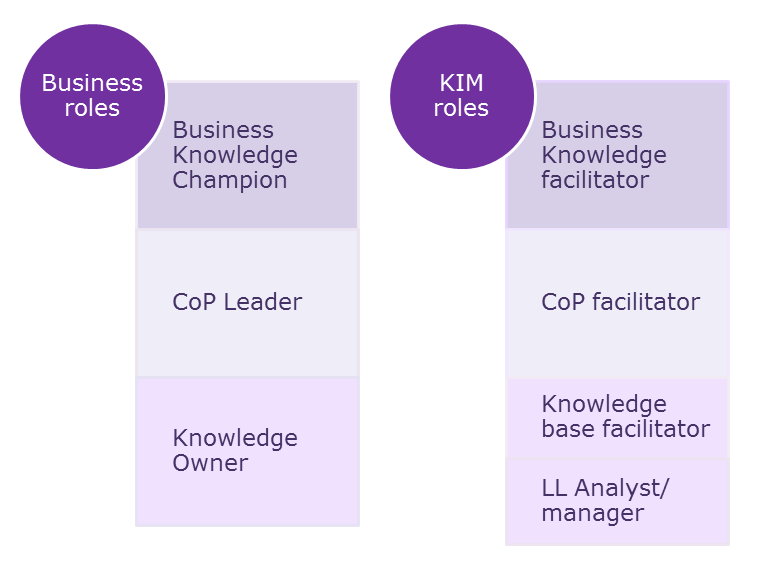 They may be supported by one or both of the following KM roles, which again focus on the mechanics of knowledge management rather than the business content of the knowledge. support LL Information Sharing via databases, websites, reports, newsletters, etc. set up or improve the organization’s LL capability. So as the diagram above shows, at each level we can see a business role with KM as a focus, supported by a facilitative KM role with a business focus. The KM facilitation roles bring the KM skills and knowledge of KM theory and process, while the business KM roles bring the business objectives and the business context. As I read the article, I sighed. At last, the role of (KM) facilitator is raised here. Even nicer is that the discussion touches both business knowledge facilitator and knowledge base facilitator. Very nice to know, and thank you Mr Milton.